Leyland cypress ‘Castlewellan Gold’ or cupressocyparis leylandii ‘Castlewellan Gold’ is an exceptionally vigorous evergreen conifer of columnar habit. It is happy growing in all positions – including seaside gardens – except soils that are either prone to waterlogging or dry out easily. Flat sprays of tinged bronze foliage will create a dense screening hedge in just a few years, even if you choose to plant cheaper, smaller saplings. The yellowish foliage will be even brighter in spring and summer than in autumn. With an annual growth rate of around 50-80cm it is somewhat slower growing than the green leyland cypress. This is largely due to the fact that ‘Castlewellan Gold’ tends to produce more bushy growth than the species during the first few years, which discourages upright growth. However, due to its bushy growth ‘Castlewellan Gold’ is capable of creating a dense screening hedge almost immediately, while green leylandii hedges tend to be more open at first. Compared to other species of hedging conifers, however, 50-80cm is incredibly fast. Leylandii ‘Castlewellan Gold’ requires two or three clippings a year and can easily be kept relatively narrow, despite its vigorous growth habit. It will not regrow from bare wood, which makes it impossible to successfully reshape overgrown leylandii hedges. 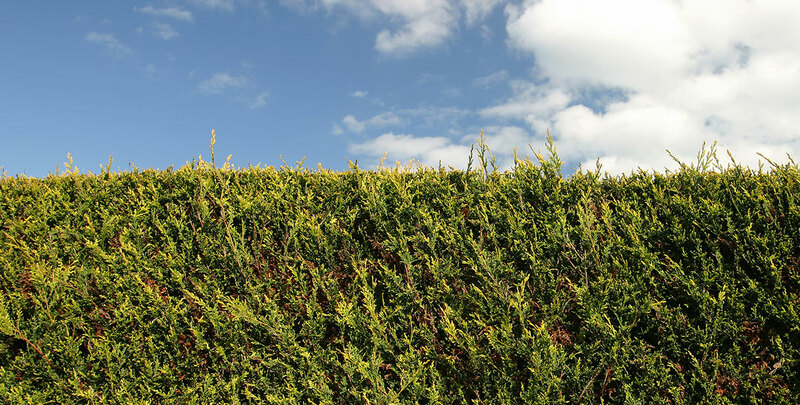 As long as leylandii hedges are well maintained they make great screening hedges, tall or small.